Diglycerides play a central role in lipid metabolism and signaling in mammalian cells. Although diacylglycerol molecular species comprise the majority of cellular diglycerides that are commonly measured using a variety of approaches, identification of extremely low abundance vinyl ether diglycerides has remained challenging. In this work, representative molecular species from the three diglyceride subclasses (diacyl, vinyl ether, and alkyl ether diglycerides; hereafter referred to as diradylglycerols) were interrogated by mass spectrometric analysis. Product ion mass spectra of the synthesized diradylglycerols with varied chain lengths and degrees of unsaturation demonstrated diagnostic fragmentation patterns indicative of each subclass. 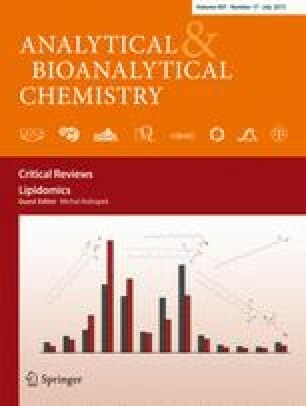 Multidimensional mass spectrometry-based shotgun lipidomics (MDMS-SL) analysis of mouse brain and heart lipid extracts were performed using the identified informative signature product ions. Through an array of tandem mass spectrometric analyses utilizing the orthogonal characteristics of neutral loss scanning and precursor ion scanning, the differential fragmentation of each subclass was exploited for high-yield structural analyses. Although molecular ion mass spectra readily identified diacylglycerol molecular species directly from the hexane fractions of tissue extracts enriched in nonpolar lipids, molecular ion peaks corresponding to ether-linked diglycerides were not observable. The power of MDMS-SL utilizing the tandem mass spectrometric array analysis was demonstrated by identification and profiling of individual molecular species of vinyl ether diglycerides in mouse brain and heart from their undetectable molecular ion peaks during MS1 analysis. Collectively, this technology enabled the identification and profiling of previously inaccessible vinyl ether diglyceride molecular species in mammalian tissues directly from extracts of biologic tissues. This work was supported, in whole or in part by the National Institutes of Health Grants RO1HL118639-02 and RO1DK100679-01A1. R. W. G. has financial relationships with LipoSpectrum and Platomics. The online version of this article (doi: 10.1007/s00216-015-8640-3) contains supplementary material, which is available to authorized users. This work was supported, in whole or in part, by National Institutes of Health Grants RO1HL118639-02 and RO1DK100679-01A1. R. W. G. has financial relationships with LipoSpectrum and Platomics.